Today’s post is the first guest post for 26.2 Quest. The post was written and submitted in late November but if you haven’t noticed the posts have been few and far between this past month and I neglected to get it posted until now. 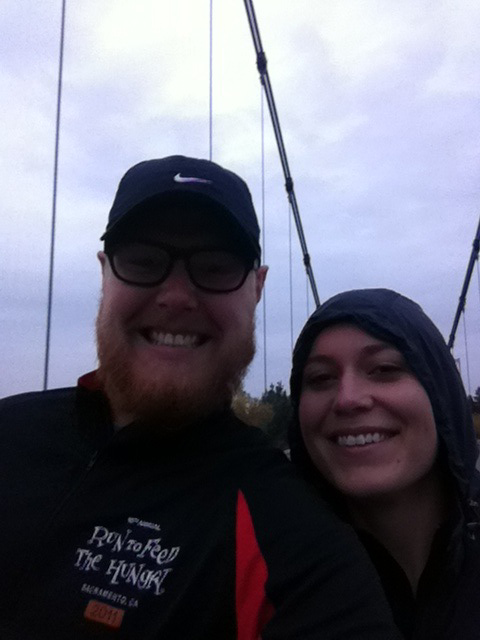 The post was written by Chipper Nicodemus who works for Healthline.com, and was written about his experiences leading up to and conquering a big PR in a Thanksgiving Day 10k. Running was always something I was forced to do. Baseball and wrestling were my sports in high school and running was never a reward we got for doing well. So you can imagine how foreign the idea of running for fun might be. Now several years later, I can say, much to my friends amazement, running is fun. Allow me to explain. For 3 years now my wife and I have been running in the local “Turkey Trot” 10k at my alma mater Sacramento State University. We did this so we could have a tradition to start following and to burn off some calories before we over ate on turkey and other traditional fixings. My usual training had been a handful of 3 mile runs about two weeks before the race. Needless to say, this left me gasping for air and useless for the remainder of the food gorging holiday. This was not fun running as I had claimed I participate in now. I vowed to make it different this year. A few life events prompted me to start running for fitness and fun. First off my weight wasn’t ever where I’d like it to be. I was always the ‘big guy’ in my group of friends. I’ve never really been in good shape since wrestling, and the idea of running several miles and being able to speak afterwards really appealed to me. So a full three months before the Turkey Day race I started changing my lifestyle. I downloaded the Lose It! app, and the ever so useful Nike+ app, took pics of my ‘before’ body and stepped on the scale. I watched this video on how to pick the right running shoes and I went to the local sporting goods store and picked up a new pair of running shoes, shorts and one of those fancy tech tees. I read up on Running 101.The next day after work I took of to attempt to conquer the hills of San Francisco. A mere 1.5 miles left I was about done. I could only muster around the same distance for the rest of my 3 runs that week. I set a goal for myself that every Saturday I would do my ‘push yourself’ longer run. My first push run was an excessively San Franciscan hilly 3 mile run, about half way through I realized I bit off more than I could run. Only a few weeks later I was easily handling 3 miles and working on some 6 mile runs. Every run I was hitting personal records for 10k without too my effort on my part. Here in San Francisco we are blessed with great running weather, so most of my runs were in perfect 60 degree weather. After several 10k and longer runs, I felt more prepared for the Thanksgiving Run to Feed the Hungry than any previous 3 years. Now it was race day. My alarm woke me up at 5:30 am, on a chilly Sacramento morning, working on just over 4 hours sleep. I got dressed in my favorite shorts and shoes, grabbed a few Gu packs and started hydrating. My wife and I headed out for my alma mater Sacramento State University, but not before a much needed stop at Starbucks for a coffee and banana, which has become my go to pre-run morning meal. We were parked and headed over to meet with our team Cal Fit for our pre-race picture. That is when a monkey wrench got tossed my way. Rain. I’ve never had to run in the rain before. Usually rain was a great excuse to get out of running, but today I was looking forward to the challenge. I tried to say dry as best I could with some help of some redwood trees. About 5 minutes before the start, I headed towards the ‘8 min/ mile’ sign, which was my stretch goal pace, but I was just shooting for a new personal record which would be below 55 minutes for the 10k race. The local radio jock was doing his best to cheer up the wet runners before the starting gun was shot. GO! 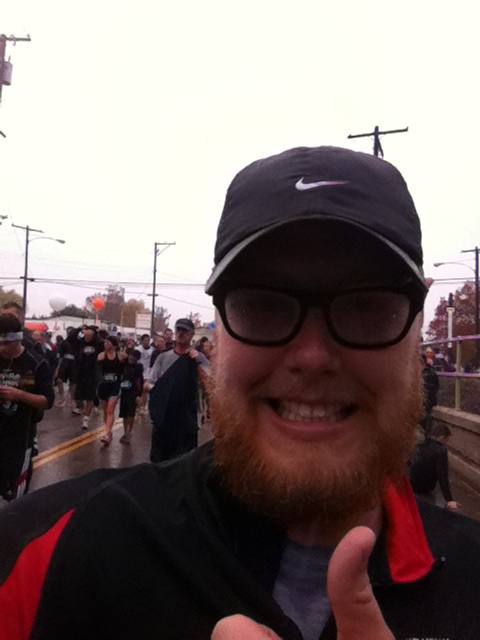 I was off and despite the massive amount of people; I got to a decent start, but kept my pace steady. Around mile 1 I felt that my socks and shoes were soggy, but it didn’t affect me too badly. Every mile marker I checked my watch and spent the next quarter mile calculating my pace and if I was on track for my PR. Around the half way mark at 5k, I looked at my watch and realized that there are some people about to finish the race in less than 5 minutes. I pushed on and was keeping a solid pace at around 8 minute miles, which is great for me. Somewhere between mile 4 and 5, I slammed my Gu pack and pushed on. I hit mile marker 5 and knew I had to make my push; there was no reason not to leave everything on the field so to speak. I rounded the corner and headed for the final straight away, finish line in site. I checked my watch and a little off my stretch goal, but in great position for my new PR. At the 6 mile marker I took off in a dead sprint and the official clock was becoming more readable through my rain filled glasses. About 100 feet from the finish line I saw the clock tick closer to 52 minutes. I hit the after burners and sprinted through the finish line still a few seconds to spare before 52 minutes. Exhausted and fulfilled were the two feels I felt immediately. I stopped my watch timer and my Nike+ app, both informed me of my new personal record. I walked over to the refueling station and grabbed another banana and several bottles of water. The chill of rain soaked clothes set in and I was ready to head home and hit the comfort of a warm shower. I waited for my wife to finish her 5k walk and when she did I informed her of my new accomplishment and she congratulated me. We both refilled our waters and headed home to enjoy some football and turkey dinner. I felt great for the rest of my day with my very own runner’s high and even managed not to eat too poorly for all 3 of my Thanksgiving dinners. I’m really looking forward to my next running adventure which is my first ½ marathon in March. Any tips or tricks for my first ½? Please share with me below in the comments. This guest post, the first for 26.2 Quest, was written by Chipper Nicodemus from Healthline.com. Great job on your PR! Every time I try a new distance, I tell myself that the goal is to finish the first time, then I get excited about signing up for a new race to work on gettin faster the second time around.